Purchasing real property is most likely one of the biggest financial decisions you will ever make. Whether this is your first purchase or you are an active real estate investor, this decision must be made carefully. Are you looking for a rental or investment property? Would you like more square footage? Property ownership is an excellent investment; whether you are looking for your dream home, a rental property, or to expand your investment portfolio. Owning real estate is one of the least risky ways to build equity or to obtain a greater return on your initial investment, but it requires commitment and may require a substantial portion of your income, monthly. Do not break any large purchases or move monies to new or “unseasoned” (less than 2 months) accounts. Select a few properties that interest you the most and contact me to make an appointment to visit them. Ask me about the potential long term resale value of the properties you are considering. Once you have picked out the property you want to purchase, I am here to help you make an offer that the seller will accept. A good broker will investigate the potential costs and expenses associated with the new property. Our goal is to help you draft your offer in a way that gives you the advantage over another offer. Once your offer is accepted by the seller, you will need to have a licensed property inspector inspect the property within the time frame that was agreed upon in the effective contract to purchase. You may elect to have different inspectors inspect the property if you wish to obtain professional opinions from inspectors who specialize in a specific area (eg. roof, HVAC, structure). If you are purchasing a commercial property, then you will need to have an environmental audit done on the site for the lending institution. I can recommend several different inspectors & affiliates of Coldwell Banker. More of a formality than anything else, the final inspection takes place a day before, or the day of the closing. You will visit the property to verify that all is in working order, everything’s the same as when you last viewed the property, that there are no extra items left behind, and that everything included in your purchase is still at the property. We are ready to assist you should an unforeseen glitch pop up, even at this last stage. Something at the property breaks down, or some other minor detail – no need to worry. We have encountered these problems before so we know how to handle them efficiently and quickly. The closing agent will furnish all parties involved with a settlement statement, which summarizes and details the financial transactions enacted in the process. You and the seller’s will sign this statement, as well as the closing agent, certifying its accuracy. If you are obtaining financing, you will have to sign all pertinent documentation required by the lending institution. If you are unable to attend the scheduled closing, arrangements can be made depending on the circumstances and the notice that we receive. If you are bringing funds to the transaction, you can elect to either have the funds wired electronically into the closing agents escrow account, or bring a certified bank check to the closing in the amount specified on the settlement statement. The seller should arrange to have all property keys and any other important information for you at the closing so that you may receive these items at this time. I understand that buying a home is more than just a transaction; it’s a life-changing commitment. My team of seasoned real estate professionals are dedicated to providing exceptional, personalized service for all of my clients. I take pride in the relationships I build and I work on my client’s behalf to help them achieve their real estate goals. My team of Coldwell Banker real estate experts represent the best and brightest in the industry, and we’re always striving to lead the field in research, innovation, and consumer service. Today’s buyers and sellers need a trusted resource that can guide them through the complex world of real estate. 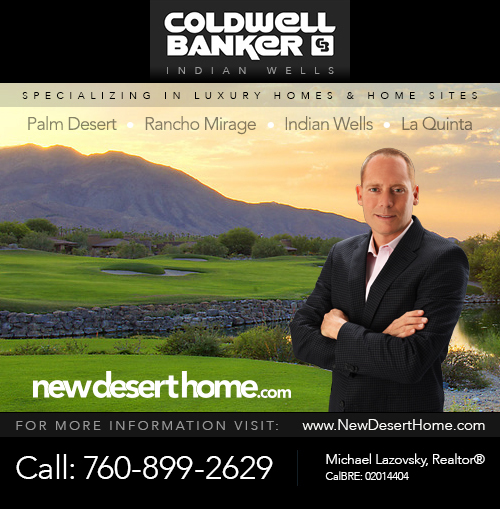 With Coldwell Banker’s extensive knowledge and commitment to providing only the best and most timely information to our clients, Michael Lazovsky & Coldwell Banker is your go to source for real estate industry insight and advice for properties throughout the Desert Cities and Mountain areas of Southern California. I pledge to be in constant communication with you, keeping you fully informed throughout the entire buying or selling process. I believe that if you’re not left with an amazing experience, I haven’t done my job.